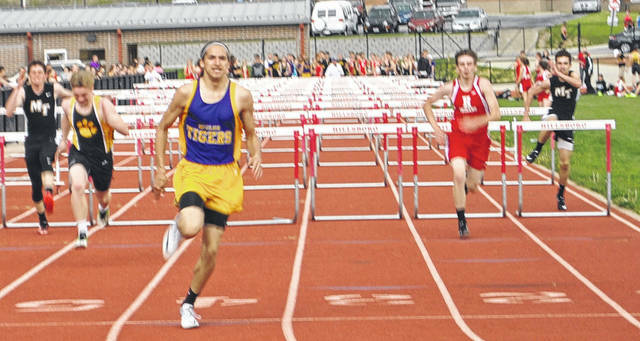 In this file photo from the 2017 season senior Landree Gray crosses the finish line in the boys 100-meter hurdles at Hillsboro High School during the 2017 Hillsboro Invitational. In this file photo from the 2017 season senior Chayden Pitzer crosses the finish line in the girls 100-meter dash at Hillsboro High School during the 2017 Hillsboro Invitational. The McClain boys track and field team, currently preparing for the upcoming season, has some big shoes to fill this year. Tristan Pitzer advanced to the OHSAA D II State Track and Field Tournament in the 200-meter dash. Pitzer graduated after last season and left a hole that will need to be filled by other athletes this season. “We definitely lost a lot of great pieces from last year’s team but I believe we have gained a few key pieces as well as return some experience in certain areas. In terms of returners who I expect to be key pieces, I have to start with guys like Trevor Newkirk and Jordan Pearson. Trevor will be a good piece in our 200/400 rotation and Pearson will be a leader in the throws. Reece Schluep will also be expected to do good things for us in distance races. All three have worked hard to get here and have been great examples of the mentality we want to see at McClain,” said McClain boys coach Nate Luke. The Tigers will have eight seniors on this year’s team and coach Luke is expecting them to be an example for the underclassmen. “I fully expect the seniors to be leaders and workers first and to set the example for younger guys to follow. Any successes will fall into place because of that,” Luke said. Luke will also look towards some of the underclassmen to perform well for the team this season. “I fully expect some of our freshmen this year to be big contributors in relays. I expect guys like Cody Elliot, who is a first year thrower to be a big part! Gabrielle Chiossi will also be a big part of the distance team as well,” said coach Luke. Coach Luke finished by inviting the Greenfield community to come out and support the team during the upcoming season. “First and foremost, they would be watching kids that work their tails off and do what we ask them to everyday. Second, there’s no better sports moment than watching two or three kids battle it out in the last 100 meters of a race. I have a feeling we will have a few of those exciting moments this year,” Luke said. 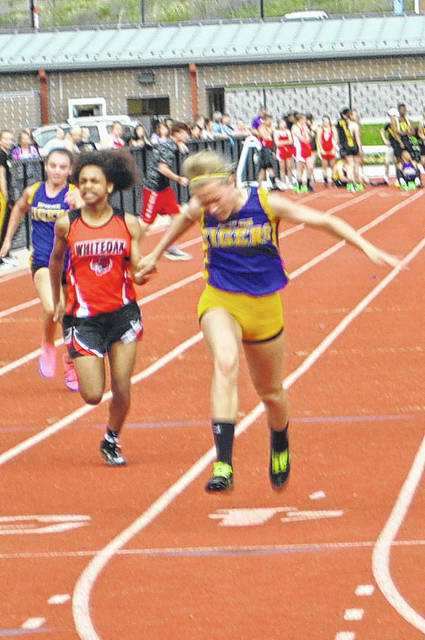 The Lady Tigers track and field team are coming off of one of their most successful seasons in school history that saw them place four girls in the OHSAA D II State Track and Field Tournament as part of the 4×200-meter relay. “All of our returning letterwomen are expected to step up and compete as hard as they can. That group is spearheaded by 2017 state qualifying sprinter and hurdler Pitzer. Also returning from the state qualifying 4x200M team is senior thrower/sprinter, Scott and sprinter/mid-distance runner, sophomore Hardesty. They will be expected to be positive leaders for our team. We have a lot of freshman so we need leadership. Also returning will be seniors Emily Parker, Natalie Cunningham and Rachel Clark. They are included in a group of upperclasswomen that will need to lead and help our point totals this season,” Orr-Zody said. Lady Tigers head coach Jake Orr-Zody has high expectations that the team will build off of the success of last year. “My expectations are for us to build on our achievements from a year ago. We had some exceptional efforts and went to places our program has never been. I think this year we need to focus on building depth and competing as a team. I expect us to score more total points per meet this season,” said Orr-Zody. Coach Orr-Zody expects the eight seniors on the team to be leaders and role models for the underclasswomen on the team. “We have 8 seniors on our squad. I’m looking for them to work hard and give tremendous effort and to demonstrate excellent character. We need them to be positive role models and examples. Some of them have extremely high individual and team goals so I look forward to helping them along the way,” said the girls coach. Orr-Zody is excited about the possibilities with his team this year and attempted to share some of that excitement with the community while inviting them to come and support the Lady Tigers this season.